The end of January already and a new season of orienteering beckons with the upcoming Waikaia Orienteering Weekend marking the start of the 2017 SuperSeries, and to be followed by the High Performance Camp. Already, however, Wellington has run a very successful regional camp reported below, and preparations are on-going for a whole list of major events that are now well and truly appearing over the horizon – Oceania, the ANZ Schools Test Match. WMOC2017, as well of course as trials for a whole variety of New Zealand teams. The Wellington Regional Training Camp took place over Wellington Anniversary Weekend and was attended by about 50 orienteers. These ranged from top junior and senior elites to promising younger juniors, and, with an eye on WMOC2017, a number of the top asters orienteers including Carsten Jorgensen and Bill Edwards. 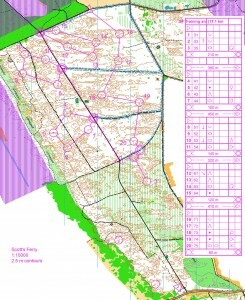 With many of the areas sprint maps unavailable for one reason or another, proceedings started on Saturday afternoon on Mt Lees, some 20 km to the west of Feilding. 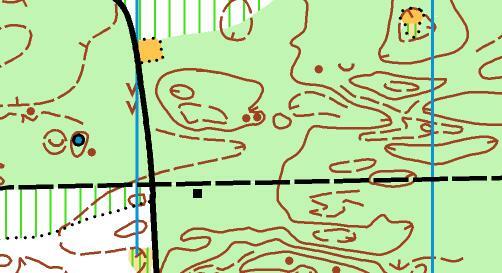 Mt Lees is not your normal sprint map, but has been extended on to farmland to the east of the old map, and does give the opportunity for practising rapid route choice (shown above) i.e. working in pairs and having 5 seconds to make a route choice before racing each other to the control. At the top level this tests the ability to make fast, accurate route choices with the racing aspect ensuring that there is an element of physical pressure in the exercise. This exercise was followed by a similar version with much shorter legs, before participants were given the option of running one of two courses set by Graham Teahan for the Australian training camp held in the Horowhenua/Manawatu in December. The day finished with a relay race through a 20 m x 20 m maze. wet day. These include simplification and relocation, and one exercise intended to make people navigate under extreme physical pressure. Athletes were asked to do a series of hard running interval before, after each one, immediately going into a short orienteering course. 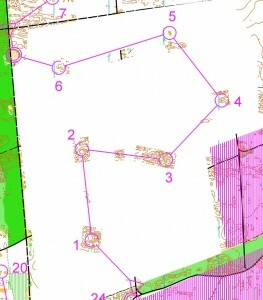 As the map shows the longer intervals (blue dashed lines) ranged from about 800-1500 m, with the shorter option (purple dashed lines) between 300 and 500 m. This was partly intended to also be an example of the level of physical training that is necessary if one wants to compete seriously at the top level (i.e. JWOC/WOC) and significantly improve strength and overall speed. Nick Hann commented on this kind of exercise being excellent training for long distance as it made him feel as if he was in the middle of a hard long race rather than a training exercise. The final day of the camp was on the old favourite of Osgiliath and started with a windows exercise which demanded accurate direction and estimation of distance as well as testing ability to recognise terrain features. Short O-intervals in the macrocarpas and a mass start relay exercise with splits provided were also included.. Many thanks are due to Paul Teesdale-Spittle who not only was the chief organizer but again produced a wonderful variety of testing training exercises for the younger juniors. Unfortunately, the down side for Paul was having his car stolen from the middle of Feilding Motor Camp over Saturday night. Trials for the World Games, JWOC and the New Zealand Secondary School Team for the ANZ Schools Test Match will take place on Saturday and Sunday 25/26 March. These will also double as Round 2 of the 2017 SuperSeries at both M/W21E and M/W20 level. The sprint and middle distance areas are 10 minutes drive apart. Map: Hydrabad Refloated, Waitarere Beach: Largely complex sand dune forest of variable runnability, some open areas.Previous use: small parts at QB2013, otherwise a remap of an old area not used for over 15 years. Although triallists should already have notified the relevant convenor of selectors, they do need to formally enter the events. This is also true for athletes entering the SuperSeries races. Entry information will published on the ONZ website shortly. There is an interesting article on this topic in the latest IOF Newsletter (http://newsletter.paloma.se/webversion/default.aspx?cid=11828&mid=395380) in which Danish coach Lars Lindstrom, Belgian Sprint specialist Yannick Michiels, and Russian WOC Long distance champion from 2014, Svetlana Mironova give their views on how concentrating on specific disciplines has benefitted them both individually and from a team perspective. There is a clear view that, at least at WOC, the choice of, initially, a few athletes to concentrate on only one or two distances was perceived to give them an advantage that has now forced others to follow. As Lars puts it “the old days when you could run all races successfully has come to an end, and the development towards athletes specialising is inevitable”. This, of course, is not true at JWOC where generally everyone does race all three distances, and it remains to be seen if specialisation will decrease somewhat when WOC splits into alternate forest and sprint WOCs from 2019. Unfortunately New Zealand athletes often do not have the luxury of such choice – the cost and expense in time of attending WOC means that the relatively small number of athletes available prevents selecting the large teams that other nations have which allow athletes to concentrate on a reduced number of races. In Estonia in 2017 the 3 sprint races (individual qualification, individual final and relay) will again be on consecutive days, followed by a rest day before the long distance and another rest day before the middle and relay on consecutive days. Even for the fittest such a programme makes it hard to envisage competing in all 3 individual distances and the two relays, and raises the question as to whether NZL should make an informed national decision regarding which races it concentrates on. For example, is having the strongest sprint or male or female relay team we can put out important, or should we be concentrating on individual disciplines where a few athletes may produce significant results? Not an easy question to answer. For those planning their potential future involvement at WOC, the recent IOF Foot-O Commission minutes confirmed Denmark as the host for the first sprint WOC in 2020, although this still needs IOF Council approval. Perhaps more interestingly is that there are 2 applications for Forest WOC in 2021, one from Czech Republic and one from Brazil! “We have had some good initiatives, such as a checklist for organisers, which lists what athletes are looking for in a high quality event, and we have been involved in a lot of discussions regarding what shape WOC takes in the future”, Lizzie Ingham says. “A good example from this year, that shows we can help change, was a proposal from Jan Kocbach to the IOF for the GPS watch rules for WREs to be updated. He got in touch with us as a commission before pitching his idea to the IOF. We discussed the matter together, and wrote a letter of support to go with his proposal, which was successful”, Lizzie Ingham says. “We noticed that although there were some strong opinions and chatter online, we were not actually hearing much from the female athletes about the topic. We felt pretty uncomfortable giving a response for all female athletes on such an important topic, so we set up a survey to get a broader representative view”, Lizzie Ingham says. 452 athletes from 46 countries responded to the survey, and afterwards the data was summarised as clearly and objectively as possible to make it unbiased. The result did not give a clear consensus, but based on the opinion of the majority, the AC recommendation was to increase the winning time for the women’s Long distance from 70-80 minutes to 80-85 minutes. Normally the FootO Commission would propose rule changes, in this case about the winning times, to the IOF Council for decision. However, as there was a proposal to equalise the winning times for the men’s and women’s Long distances submitted by the Swedish Orienteering Federation to the General Assembly, it became a decision for all Member Federations. The General Assembly voted down the proposal with a clear majority, and so in the end there was no change to the Long distance winning times. “It is important that we try to represent the opinions of as broad a range of athletes as possible, in countries, ages, gender, distance specialities etc. It is good to have a mix of athletes on the commission, and to have a new face or two rotate through the commission each year”, Lizzie Ingham says. Final arrangements for the HP camp are as follows. Accommodation from 6-8 February will be in group accommodation at Alexandra Motor Camp, and for 9 and 10 February at Matterhorn South Lodge, Wanaka in a mixture of dormitory and other accommodation. Accommodation over Waitangi Weekend (nights of 4 and 5 February) is up to individuals. For transport we have a van (8 people) and a car (5 people) booked. These will both be picked up at Queenstown airport at about midday on Saturday 4 February and will be available for transport over Waitangi Weekend. Anyone wanting transport for the weekend needs to be at the airport for midday. The van will be returning to Queenstown airport at about 2pm on Saturday 11 February, the car will be travelling on to Christchurch on that day. Food will be organized for the week when we get to Alexandra on 6 February. Training will concentrate on both the physical and technical and include individual, pairs, mass start and relay training. The rough guide is as follows – 7 February: Earnsleugh (3 exercises planned, total distance ~ 13k); 8 February: Naseby (3 exercises, ~13 k); 9 February: Alexandra/Wanaka (4 exercises, ~9 k); 10 February: Wanaka (3 exercises, ~11 k). 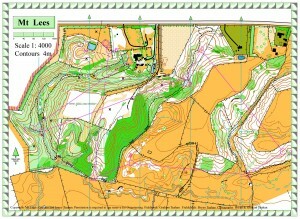 Dunedin Orienteering Club are thanked for allowing us to use Earnscleugh and Naseby, Joe Sherriff for two new maps in Alexandra, and Fraser Mills for the Wanaka maps. A report will be forthcoming in the next HP news.